I’ve developed my style with the understanding that animals respond to this work when you take time to build trust. Hour-long followup treatments and 90-minute initial visits help with that, as does the hands-on work. It helps calm the animal so we can take the next step – acupuncture! Clients are often surprised to see how well their animals respond to the needles. We dim the lights, sit, and get quiet. I often play relaxing music while the animals breathing changes, muscles let out little spasms of tension, and then hopefully they put their head down and relax. Sometimes this happens right away, and sometimes it takes time. Luckily, patience is one of my superpowers! This work is great for all things musculoskeletal – arthritis, IVDD, FCEs, hip dysplasia, post (and pre!) surgery, spinal paralysis, and an all-too-common one – neck & back spasms. Running a little current through the needles with electro-acupuncture can really benefit these dogs & cats too. Anxiety and aggression cases are challenging, but this work has something to offer animals with emotional problems. I’ve had several aggressive cats receive one session only to return home where the household dynamic is refreshed with fights no more. Anxious dogs start to drop their anxiety levels, and we discuss proven training methods for addressing this in treatment. Lots of digestive issues can be resolved with herbs, supplements, diet, and treatment. I use the best, Evergreen herbs and Standard Process supplements. Supporting animals who are receiving chemotherapy has proven very beneficial. Dermatological issues are tough, but traditional Chinese medicine has something to offer. I have a “Trauma Package” for serious cases that includes a 2-hour initial (or followup) treatment and two 90-minute treatments for the most serious cases like spinal paralysis, “hit by car”, etc. Hopefully your animal will never require this kind of care, but if they do, this plan gets a jumpstart at treating their condition. All of this work is beneficial when, and only when, clients have taken their animals to receive a thorough work up by a Veterinarian. We’ve got to rule out conditions that would benefit from a procedure or some much needed medication. As a Chinese medicine practitioner, it’s helpful to have a working western diagnosis. Your animal must be seeing a Veterinarian in order to get this kind of care. If your animal does not have a Vet and you need an evaluation, Dr. Frye, DVM of our “West End Animal Center” is available for a reasonable charge. Please let us know if you are needing this care, and the front desk can schedule an evaluation before their treatment. Feel free to call or email with questions or to schedule a session – 415.721.7494. Look forward to working with you! 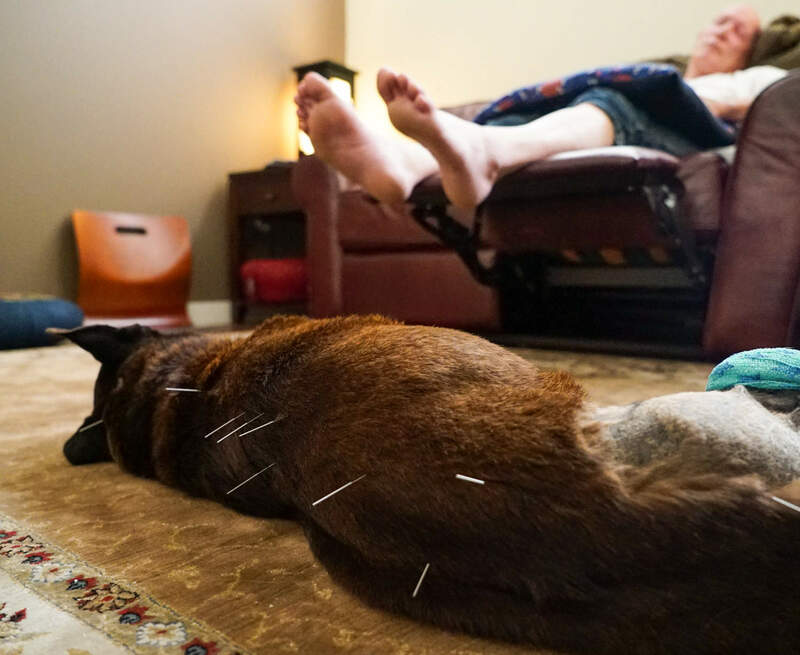 Because animals are so connected to their people, I offer acupuncture treatments to both animals and their people, together at the same time. When appropriate, this method of treating animals and healing stress within the family is powerful. As the dog or cat relaxes, so does their person, and then as their person continues to relax, so goes their animal. Sessions take place in the same room with the person on the reclining sofa or face down on a BodyCushion after a brief intake. These 90-minute treatments can only be considered after an initial visit for the animal. I practice all forms of traditional Chinese medicine including acupuncture, tui na massage, Chinese herbs, and nutrition. I always start off with bodywork to prepare the animal for the needles, which helps establish trust and relaxes the muscles. 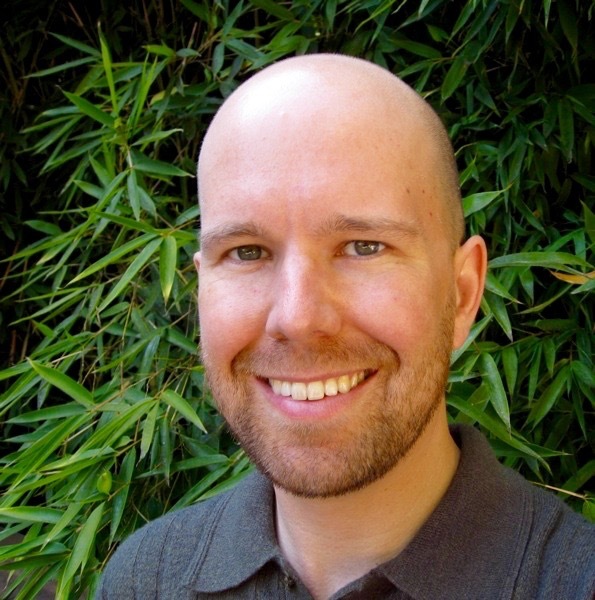 For 8 years, I taught “Acupressure for Animals” classes at the oldest school in the country teaching the Asian styles of bodywork, the Acupressure Institute in Berkeley. I know the power of touch, and I enjoy teaching my clients how to give their animals acupressure at home which brings great results. The needles are powerful tools and it’s remarkable how well the animals receive them, but in order for acupuncture not to be another procedure, I have to create real connection with the animals so they trust me. And when they do trust me, I can’t help but feel honored. I love my work! Holistic Animal Clinic sits proudly within West End Animal Center, the Veterinary Clinic of Dr. Frederick Frye, DVM. 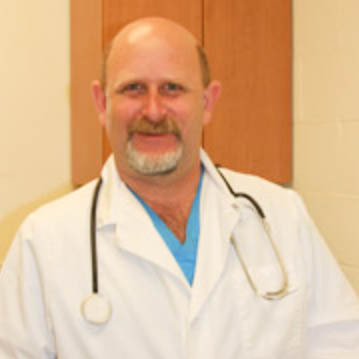 With 26 years of experience in Veterinary medicine, Dr. Frye’s experience shines into every encounter he has with his clients. He is also one of the smartest people I’ve had the privilege of working alongside. I am so happy he is my go-to-guy for all Western related questions & concerns. All of the animals who come for complementary care have the benefit of Dr. Frye’s expert medical consultations if needed. His warm approach lets you know he is really there for your animals. I’m so grateful to be working alongside Dr. Frye! Holistic Animal Clinic is part of West End Animal Center. We are just across the bridge from the East Bay & SF Plenty of off-street parking. 1660 2nd Street @G St. Call 415.721.7494 to schedule an appointment or message me through the form below. Look forward to hearing from you! We ask that you please have the most recent medical records from your Veterinarian(s) sent to us. Let them know they can email records to holisticanimalclinic@gmail.com or fax them to us at (415) 578-2854. We need the most relavent and recent records, not necessarily complete records. As many Veterinary offices require this request directly from the animal’s persons, you will need to ensure we have your animals records prior to the initial visit. If you have any questions, give us a call at (415) 721-7494. Also, to help ensure your dogs comfort during their session, take them on a short walk to relieve themselves prior to their treatment. Thank you for assisting with this and I look forward to working with you!